The Bear Hollow Lakes landslide near Riverside that nearly impacted a house (at left of photo) in the private Bear Hollow Lakes development. A concrete block barrier was subsequently placed along the road in an attempt to protect the house. Previous historical landslides are evident in the river bluff above and on both sides of this recent landslide. Photo taken February 19, 2017, courtesy of Pete Clark. 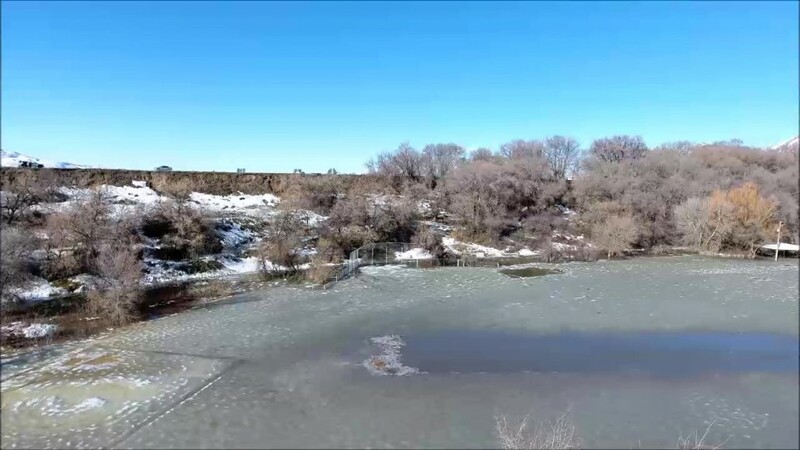 In the Tremonton area of Box Elder County, an abrupt change in winter weather caused overland flooding, riverine flooding along the Bear River, and landslides. Beginning on February 7 and lasting through February 27, 2017, weather systems moving through northern Utah brought over 4 inches of rain and warm temperatures up to 20 degrees above normal. The combination of rain and above-normal temperatures quickly melted the deep, low-elevation snowpack causing flooding and landslides. Overland flooding and a rise in shallow groundwater levels flooded fields, roads, and basements, and caused septic drain systems to malfunction. The area experienced similar problems during the record wet year of 1983. 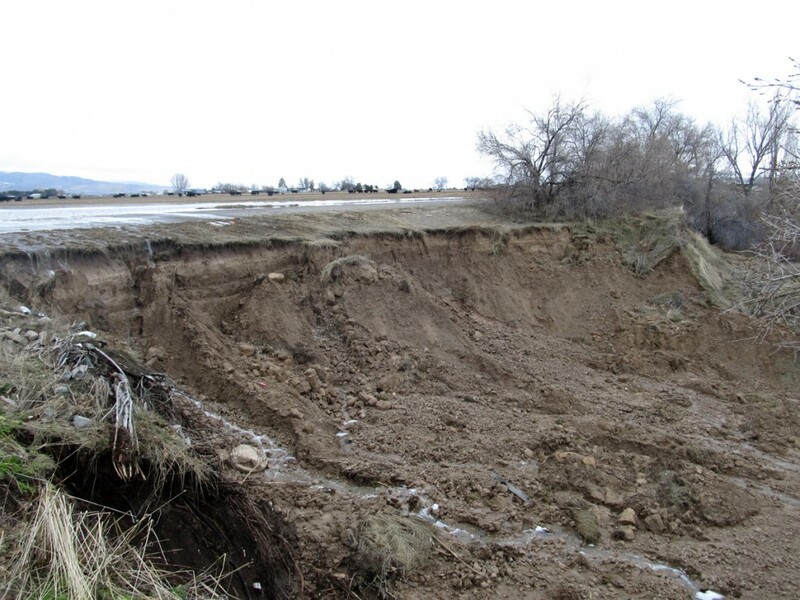 Flooding and resulting damage overwhelmed the capabilities of local jurisdictions and on February 14, 2017, Box Elder County declared a local emergency. 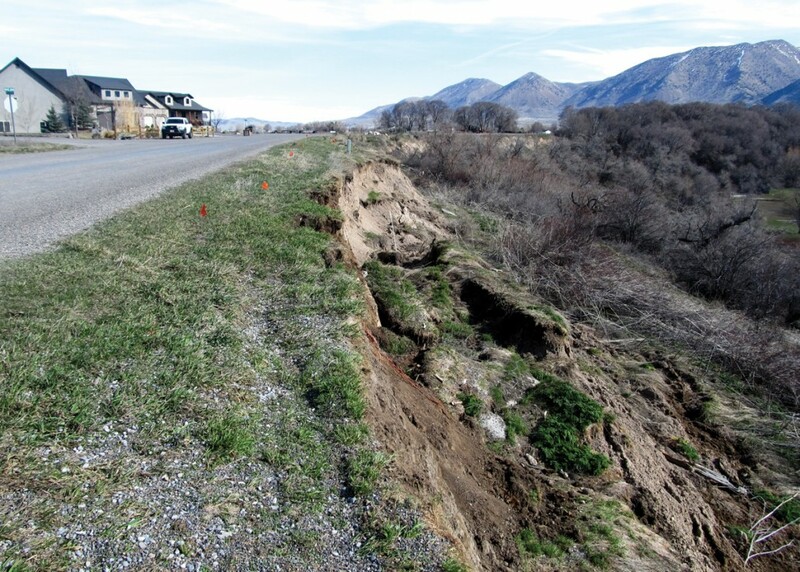 On February 17, Box Elder County Emergency Management invited the Utah Geological Survey (UGS) to assist in evaluating landslide problems. On March 31, Governor Herbert declared a State of Emergency and on April 6, requested a Presidential Disaster Declaration. On April 21, President Trump signed a Disaster Declaration for Public Assistance for $5.98 million (for both Box Elder and Cache Counties). 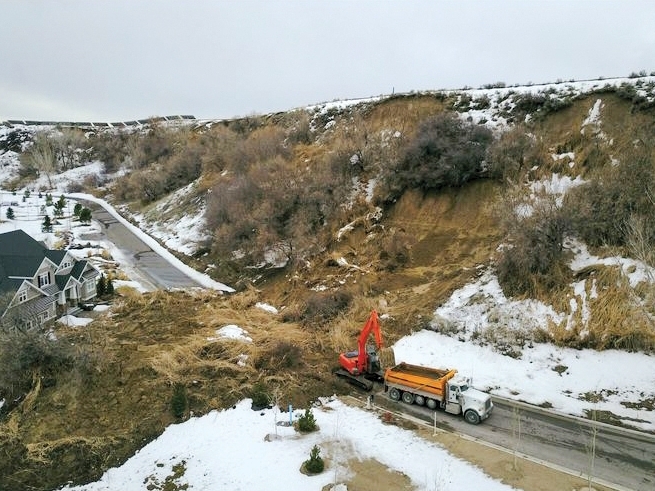 The February 2017 weather event triggered numerous landslides and Box Elder County officials were concerned about potential threats to houses and roads. All the landslides of concern lie in the bluffs above the Bear River. The river bluffs originally formed as the water level of ancient Lake Bonneville declined to modern Great Salt Lake levels and the Bear River incised into the lake bed sediments. River erosion formed large meander bends and river bluffs 50 to 120 feet high. All of the landslides observed in 2017 are reactivations of preexisting landslides with historical movement. The snowmelt and rain event appears to have raised shallow groundwater levels, saturating landslides and triggering movement that lasted from mid-winter into early spring. The UGS monitored landslide movement and advised local officials on landslide risk and associated hazards on three landslides located at 10800 North 4400 West, 9050 North River Road, and 7200 North 4600 West. The 10800 North 4400 West landslide damaged a county road. During the snowmelt and rain event, water from overland flooding was flowing across the road and onto the landslide head, keeping the landslide saturated and causing the landslide to step closer to the road. On May 2, 2017, the landslide main scarp was 9.5 feet from the road at its closest point. The landslide has removed lateral support for the roadway embankment and the road will likely fail due to this lack of support. The 9050 North River Road landslide threatens a road in Elwood City. The landslide is only 50 to 70 feet high, but extends for about 1700 feet along the river bluff. Landslide movement adjacent to River Road caused the landslide head to drop 3 to 5 feet and step closer to the road. The landslide main scarp is 6.5 feet from the road at its closest point and parts of the road will likely fail due to lack of lateral support. The landslide also threatens the access road to Hansen Park and has exposed an underground telephone cable. The 7200 North 4600 West landslide directly threatens a house. The landslide advanced a few feet closer to the house in 2017. The landslide is now 14 feet from the house at its closest point and the house was abandoned as a safety precaution. The lower landslide is at river level and under water when the Bear River is at flood stage. Flood conditions in February likely played a role in triggering landslide movement here in 2017. A fourth landslide at Bear Hollow Lakes, a private water recreation and residential development, nearly impacted a house. A concrete block barrier was subsequently placed below the landslide in an attempt to protect the house. 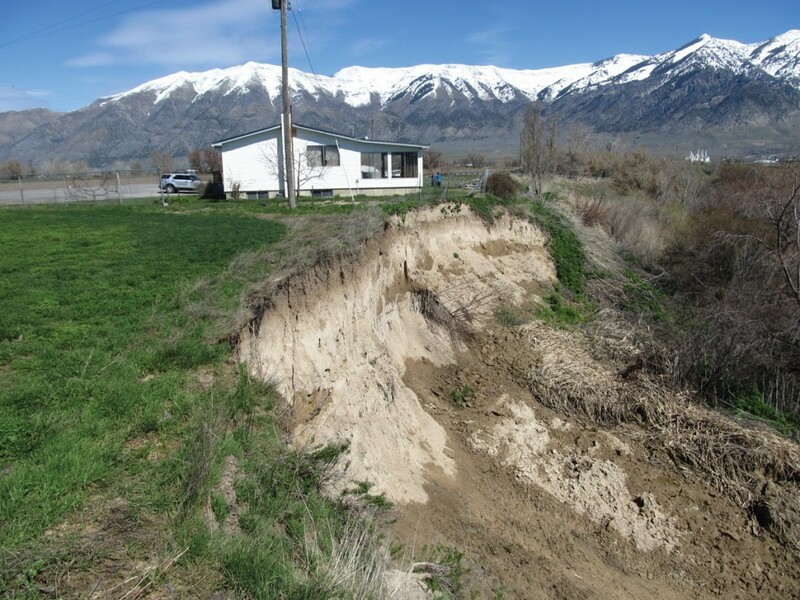 Wet years with rapid snowmelt and rain events continue to show Box Elder County’s vulnerability to overland flooding, riverine flooding, and landslides. Communities that have developed in areas where flooding and landslides damage houses and infrastructure face difficult challenges on how to manage these areas in the future. The 1983 and 2017 flooding and landslide events provide important lessons on where to build safely and how to manage these hazards when they occur. Because these landslides have shown historical movement prior to 2017, they will likely move again in the future. The recently published UGS Guidelines for Investigating Geologic Hazards and Preparing Engineering-Geology Reports will be useful for planning and managing redevelopment and mitigation of existing hazards. The UGS continues to map landslides, document historical landslide events, and monitor groundwater and landslide movement in select areas to aid in reducing landslide hazards in Utah.